Asia Pacific Consensus Forecasts is the result of a comprehensive monthly survey of over 180 prominent forecasters. Detailed coverage of Australia, China, Hong Kong, India, Indonesia, Japan, Malaysia, New Zealand, Philippines, Singapore, South Korea, Taiwan and Thailand featuring both individual and average (mean) forecasts for 11-15 economic indicators for each country. Also includes Consensus Forecasts™ for 3 variables each for five other countries within the region (Bangladesh, Myanmar, Pakistan, Sri Lanka and Vietnam). 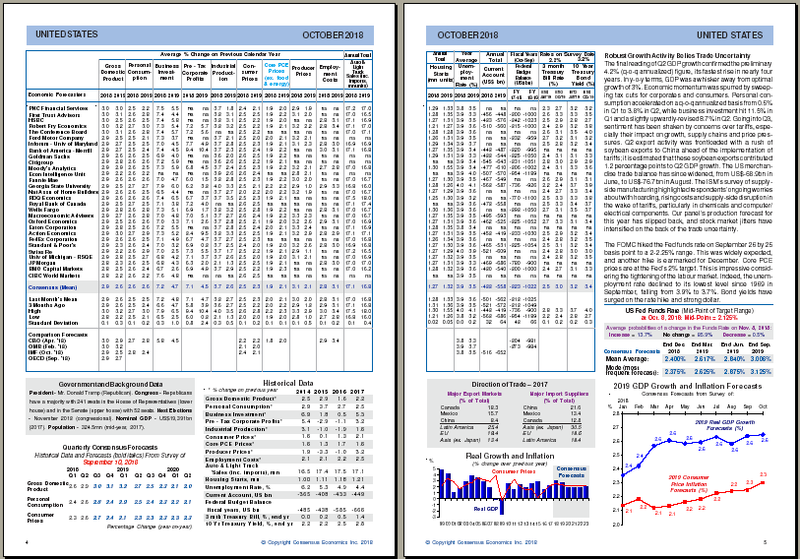 Plus: historical data, graphs and commentary, special surveys, foreign exchange forecasts, oil price forecasts, significant changes in Consensus Forecasts™, quarterly forecasts, long-term forecasts, interest rates and regional aggregates. Historical forecast data available from our Excel data service.